DJ Hire | Book a DJ Directly with 0% Agency Fees! If you love the thought of a party but want to be in it, rather than run it - hire an experienced DJ to do the hard work for you and kick up your heels to your favourite sounds! DJs are not there to dominate the event but to enrich the party and keep the tunes flowing with a great mix of records. They can help with mobile dance floors and disco lighting too, which makes your event organising a whole lot more streamlined. Hiring a DJ means you can leave the selection of music to an experienced professional who has a wealth of experience entertaining a wide range of audiences. 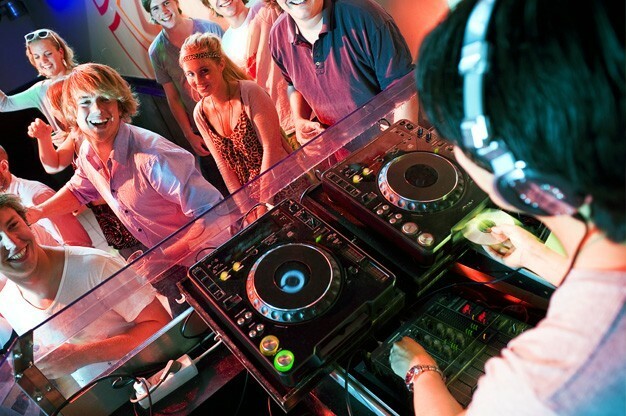 Find out more about finding and Booking a DJ for your event or wedding reception. Find a DJ for hire near you in minutes! Option 1. Enter your event location below & contact a DJ directly! Option 2. Request multiple quotes from available DJs Get Quotes! Option 3. Read information & advice on hiring DJs Read Advice! Finding the right DJ is easy with our unique and comprehensive guide. Bursting with essential tips and answers to all those niggling questions, we help you book with confidence, so that you and your guests can relax and enjoy a truly fantastic and memorable event! - WHAT WILL A DJ DO AT YOUR EVENT? - WHAT TYPE OF EVENTS ARE DJS HIRED FOR? - HOW MUCH DOES A DJ COST TO HIRE? - HOW LONG WILL A DJ PLAY FOR? - HOW CAN I FIND AND BOOK A DJ FOR AN EVENT NEAR ME? 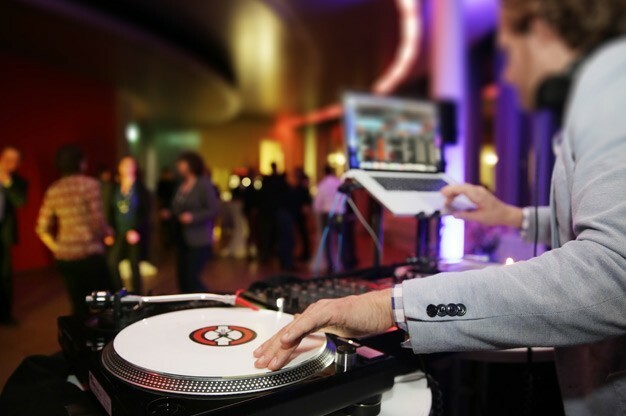 WHAT WILL A dj DO AT YOUR EVENT? DJs bring to life all kinds of special occasions, with seamless mixes specially tailored to your event, and stunning, customised lighting to create the perfect atmosphere. They play music from any era, from the 50s right through to current hits, and they are experts at keeping audiences happy and dancing, ensuring that you and your guests have an unforgettable experience! WHAT TYPE OF EVENTS ARE DJS HIRED FOR? A live DJ will create a real buzz at a wedding reception, anniversary or retirement party, and will bring genuine excitement and a lively atmosphere to corporate events such as product launches, sit-down dinners and award ceremonies. Whether you’re looking to raise the roof at a big birthday bash or in need of some background music at a cocktail party, a DJ can deliver. This all depends what type of event you’re planning, how many people will be attending, the age range and musical tastes of your guests, as well as what kind of atmosphere you’re hoping to create. While the DJ’s main job is to get people dancing, it’s important to consider what type of act will best suit your event. If you’re having a party, you might want a Party DJ who is talented at interacting with the audience and even hosting the odd party game. Party DJs are also perfect for corporate events, store openings or trade shows, where you want a fun and upbeat atmosphere. If your event is geared towards people in their twenties who just want to dance, a Nightclub DJ might be better as they will focus solely on playing great dance tunes. If club-style lighting effects such as spotlights, beams, lasers and strobes aren’t provided by your venue, this type of DJ will also be able to bring along their own kit. For something a bit different, some DJs even have a saxophonist or violinist playing along with their tracks, but whether you want straight-up classic party hits or modern club anthems, a good, professional DJ will be skilled at reading the audience and keeping the dance floor full, whatever the occasion. A great way to make sure you’re hiring the right DJ for your event is to read the reviews on their Entertainers Worldwide profile. You can also use the Contact Me form to let them know what kind of event you’re organising, what style of music you want and to ask questions such as, have they worked at similar events before? You can also request a quote, all with no-obligation to book. A DJ will be a focal point of your event and will be talking to your guests, so you want to make sure you’re going to be happy with your choice. We’ve all been at a party when the DJ puts on that track we used to love as a teenager. Suddenly, we lose all inhibitions and really let our hair down, dancing, singing and laughing with our friends. 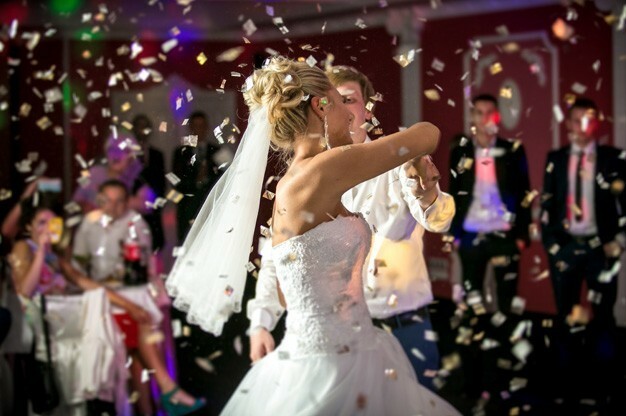 A skilled Party DJ knows just how to spark those memories and emotions. So get that glitter ball rolling and lose yourself in music and lights. Let’s make this a night to remember! Party DJs are super adaptable. They can play music from any genre to suit your occasion, and far from just spinning tunes, a professional DJ is well-rehearsed in making announcements and interacting with the audience. DJ LIVE from Illinois - One of our Party DJ's in USA, can be booked to play worldwide. There are many DJs available to hire that specialise in nightclub entertainment. Nightclub DJs are highly professional and experienced at setting the perfect tone for a party atmosphere. 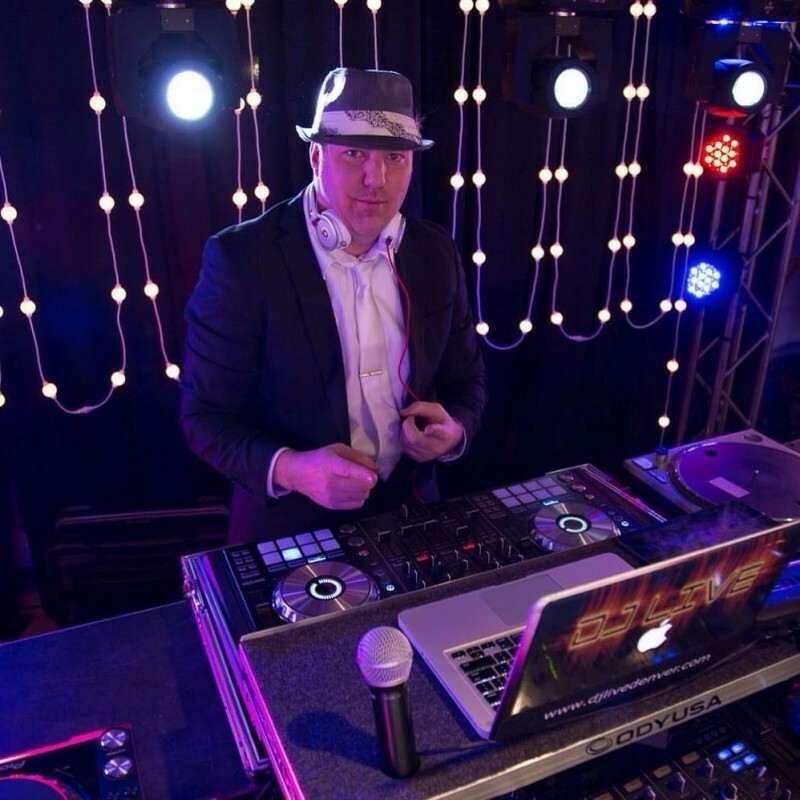 Your event doesn’t have to be in an actual nightclub, as this type of DJ will perform at all kinds of venues, where their fast-paced entertainment is ideal for upbeat corporate parties or birthdays for younger adults. If your event is in a nightclub, you may find that a DJ plus lighting is already included in the price - so it’s worth checking this when you book the venue. Karaoke is something you either love or hate, but even if you don’t fancy yourself on the mic, it’s always entertaining to watch others stand up and sing to the crowd! Karaoke DJs are trained to get guests involved, singing and up on the dancefloor, and will provide all the necessary equipment to display lyrics on screen. They are extremely versatile and can be hugely entertaining at any event, even your evening wedding reception! A Wedding DJ is a fantastic option for your evening reception. More affordable than hiring a live band, it’s a great way of ensuring that all your guests are kept happy and entertained. From announcing your first dance, to enticing those first first few guests onto the dancefloor, you can rely on a professional DJ to keep the right mix of music flowing all evening, creating that perfect party atmosphere. With digital playlists and streaming services like Spotify at your fingertips, you might be tempted to handle the music for your reception yourself. Many have learnt that this isn’t always such a good idea! There is a lot more to DJing than plugging in an iPhone and pressing shuffle. High quality equipment is essential to create a decent sound that’s loud enough without being muffled. You also need someone with a large and varied library of music and the professional know-how to read and interact with the audience, get people on the dancefloor, and keep them there. Don’t forget, your guests will be different ages and have varied musical tastes, and you want to cater for all of them. By all means, give your chosen DJ a list of 20 or so favourite tracks but leave the rest up to them. He or she will be an experienced entertainer, so you can relax knowing that you’re in safe hands. While you don’t necessarily want too much chatting on the mic, a Wedding DJ will be comfortable introducing the newlyweds and making any other announcements as required throughout the evening. Most wedding DJs can theme their sets and performance style to whatever era or style of music you want for your wedding. Whether your wedding party is Swinging Sixties themed, 70s disco vibe, 80s electro, House music, Northern Soul, Motown or contemporary chart, most DJs can create a great show with lighting to match. As well as customising the music, experienced wedding DJs can also work with you to customise the look of their equipment and light show to match your colour scheme. Although this is likely to be an additional cost option, it's possible to hire colour coordinated PA speakers and DJ decks, as well as themed lighting gobos, backdrops, projectors, video screens and more. Importantly, Wedding DJs can supply professional lighting to suit your event, from warm and stylish mood lighting for your drinks reception, to a gentle spotlight on the first dance, to full-on disco lights, laser beams and a smoke machine for the evening party. You can even opt for customised lighting to match your wedding theme, whether it’s vintage or modern. Special backdrops, projectors or video screens can also be included, to really bring your theme to life. Whatever you’re imagining, talk it over with your chosen DJ when you book so he can make it happen! Hiring a DJ is a great option if you have a limited budget, as it’s generally much cheaper than booking a live band. That said, the price will vary depending on their level of experience, how far they have to travel to your event, the type and size of the event, the quality of their equipment and the size of their music collection. You can pay anything between £300 ($300 in the U.S. and 400€ in Europe) for a local party DJ to £1000+ for a high profile DJ with the best equipment and lighting. Typically, a good, professional DJ will cost between £400 and £600 ($600 in the U.S. and 700€ in Europe). If your chosen DJ has musicians or singers included in their act, or you’re booking at high-demand times such as Christmas and New Year’s Eve, you can expect to pay more. As with booking any act, it’s worth paying for a reputable DJ who can be relied upon to deliver great entertainment as the focal point of your event. See our Essential Tips below for information on booking terms and conditions. DJs are constantly researching and developing their music libraries and honing their craft. They have learned the art of reading a crowd and keeping the energy flowing with the right mix of music. Outgoings include music, equipment, clothes, travel and marketing, and they need to factor these things in when setting their fees. When it comes to finding just the right one, we’re here to help. Our easy-to-use entertainment directory allows you to search for the best DJs in your area and you can then use the Contact form to message them directly and ask for a no-obligation quote. You will find that some acts also add a rough price guide to their profile, which you can confirm when booking. This can range from a 10-minute segment to a 10-hour marathon. Party DJs will keep the tunes coming for the duration of your event, typically for 3 or 4 hours, with a break in between, during which time he will leave some background music playing. A Wedding DJ booked for the evening reception will usually start at around 8pm and go on until midnight, with a short interval half way through. Always agree timings with your chosen act when you book. Nightclub DJ sets may be shorter, especially if multiple acts are performing on the same night. It really depends on the booker’s requirements. DJs will generally play for as long as needed. If your event is due to last all day, you can speak to your chosen DJ and agree on a schedule together. Extra or longer performances will cost more so keep an eye on your budget. When choosing your venue, it’s a good idea to consider the type of event you’re planning and what space and set up facilities you’ll need. How much room will be needed for the DJ’s table and equipment, including PA system and lighting? Is your DJ including musicians in their set or do they have an assistant? Will you need room for a separate host? Is the room big enough for all of your guests? Is there parking and easy access, allowing your DJ to set up easily and quickly? Even though your DJ will mainly be in one spot, they will need a certain amount of space in order to be comfortable and put on the best possible show. Your chosen venue may have a DJ booth or stage area. If not, we recommend a minimum area of 8ft x 5ft (2.5m x 1.5m) for a DJ + turntables, mixing desk, vinyl or laptop, monitors and lighting stands. If in doubt, check with your DJ. Event DJs, also known as mobile discos, come fully equipped with all their own equipment, including decks, PA system, microphones and lighting, and can play from almost anywhere! Whatever the venue, large or small, indoors or outdoors, your DJ will need the basics of a dry/covered area to set up, a safe supply of electricity and at least four power point sockets near the stage area. It usually takes an hour or two for a DJ to unload their equipment, set up and sound check. It will take longer if there are extra features such as complex lighting or video screens to install. If you’re organising a corporate event, or family fun day, with speeches and presentations, and you’re hoping to use the DJ’s microphone, it’s best to check with them first. Most DJs nowadays use wireless microphones and some prefer other people not to use their equipment, in case it gets damaged. However, your DJ may be able to provide an extra hand-held mic, so don’t forget to request this if necessary. Most DJs will not be expecting a fully-fitted dressing room, they will need somewhere away from the guests to get changed, warm up and relax in between sets, ideally with a mirror. A small room or back office is often sufficient. Popular DJs get booked up months, or even years, in advance. Friday and Saturday nights are often busy times and Christmas Eve and New Year’s Eve get booked up well in advance. So, for the best chance of getting your first choice of DJ on the date you need them, consider booking as much as a year in advance. A DJ may have travelled some distance to get to your event and has a long night ahead. If you are able to feed him or her a decent meal and provide soft drinks, they will love you forever. DJs will usually require a deposit of around 15-20% of the overall cost, in order to secure the booking. This protects the performer against lost income in the event of cancellation, and also gives you reassurance that you have a confirmed and committed booking. These will usually be included in the quote you are given, as the DJ will need to calculate their travel costs, especially if they are travelling some distance. Thankfully this rarely happens, but in the unlikely event that, due to illness or other unforeseen circumstances, the DJ is unable to perform for you as agreed, they should have a contingency plan. This will usually mean they send a similar act in their place, at no extra cost to you. For confirmation of this, you can check the Terms and Conditions in the contract. These conditions should be laid out in the contract you receive when booking, so check before signing. If you have any reason to think your event may not go ahead as planned, it’s advisable to let your DJ know as soon as possible. We would recommend that you check with your chosen DJ that their equipment is PAT tested (Portable Appliance Testing) so you know it’s safe to use. Ideally, the venue you’re hiring and the DJ will have Public Liability Insurance. This covers you in the event of a claim, should any members of the public or guests be injured at your event, or any damage be caused to property. If your DJ is a member of the Musician’s Union or Equity, trade unions that represent live performers in the entertainment industry in the UK (or the American Federation of Musicians in the U.S.), this gives you extra reassurance that they are professional and trustworthy, fully insured and abiding by industry standard contracts. Booking a DJ couldn’t be easier with EntertainersWorldwide.com. Simply search through our DJ listings to view profiles, read reviews and check out video samples of our entertainers in action. Once you’ve decided who you would like to contact, simply click on the Contact Me button on their profile page and send them a message or request a no-obligation quote. How can I find and book a band or live music for an event near me? Using Entertainers Worldwide, you can search and browse hundreds of DJs and much more! Search now to find a DJ for your event, or Request Multiple Quotes from a selection of live bands - complete this form - this is a free service. WANT TO RECEIVE A RANGE OF QUOTES FROM DJs?